Quarterback Joel Klatt completed 28-of-36 passes for 398 yards and three touchdowns, leading Colorado to a 41-20 rout of Texas A&M. The Buffs raced to a 21-0 first quarter lead, never looking back, sending the Homecoming crowd of 50,686 into the cool fall Boulder evening with much to be excited about. While the final score and statistics painted a picture of complete dominance by the Buffs, the issue was still very much in question … in the first minute of play. On the second play from scrimmage, Aggie quarterback Reggie McNeal hit receiver DeQawn Mobley for 60 yards. It appeared that Mobley might score on the play, but instead the ball was fumbled, recovered by Buff safety J.J. Billingsley on the Buff 20-yard line. Colorado then marched 80 yards in five plays, culminated in a 51-yard touchdown pass from Klatt to running back Hugh Charles. After a three-and-out by the Aggies, the Buffs again struck quickly. A 65-yard drive resulted in a four yard Charles touchdown run to up the Colorado advantage to 14-0. Another short Texas A&M possession resulted in a punt, and another long Buff touchdown drive. This time, the 80-yard drive was completed when Lawrence Vickers scored from three yards out. With 3:57 still left to play in the first quarter, the Buffs were up 21-0. In the second quarter, Colorado continued to dominate. Two A&M field goals were offset by a one-yard touchdown pass from Klatt to Vickers, to go with a 20-yard field goal by Mason Crosby just before the half to put the Buffs on top, 31-6, at halftime. Taking the second half kickoff, the Buffs marched 52 yards before settling on a second Crosby field goal, this time from 30 yards, to give the Buffs a 34-6 lead and for the most part answer any questions about an Aggie comeback. After a Klatt to Quinn Sypniewski touchdown pass covering 36 yards gave the Buffs a 41-6 advantage midway through the third quarter, the remainder of the second half was played mostly with second and third team players. Texas A&M did score two consolation touchdown in the last six minutes of the game to make the final score 41-20, but by that time many of the fans were on their way home, content with a satisfying win over a quality opponent. On the heels of a 4-1 start, the Buffs entered the national spotlight the next day, entering the polls at No. 24, the first ranking for Colorado in over two years. 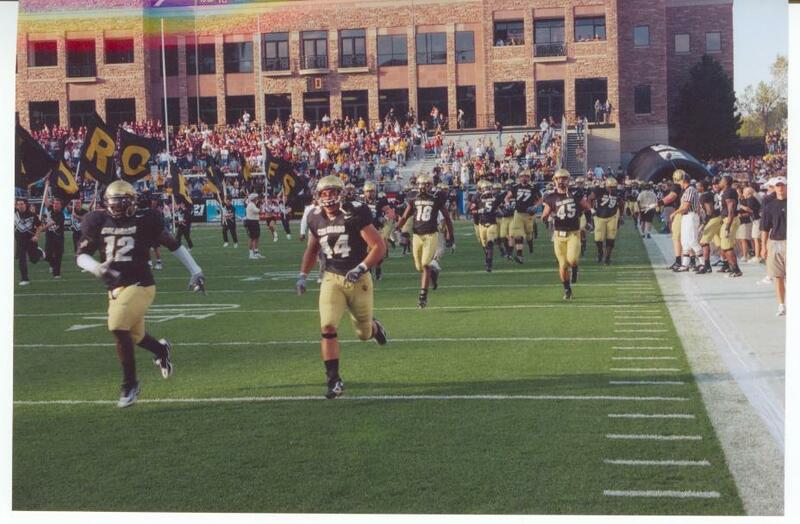 The Buffs, at 2-0 in conference play, were the only undefeated North team. Kansas State, Nebraska, and Missouri were 1-1, and Iowa State and Kansas were 0-2. The Buffs had surrendered only 20 points in their two conference wins (only six points allowed by the first team defense), and after five games overall, were putting up some impressive defensive numbers. Colorado was ranked 6th nationally in rushing defense (77.6 yards/game), 11th in scoring defense (14.2 points/game), and 19th in total defense (300.0 yards/game). The defense would have to post equally strong numbers if the Buffs were to compete with their next opponent. The Texas Longhorns were 5-0, ranked 2nd in the nation, and were fresh off of 45-12 pasting of Oklahoma. With the memories of five straight losses to the Sooners erased, Texas was on a 12-game winning streak. The Longhorns came into the Colorado game having been ranked in the top ten nationally for 23 consecutive weeks, and were led by Heisman Trophy candidate Vince Young. The Longhorns’ junior quarterback was 22-2 as a starter at Texas, and had already been named national player of the week once in leading the Longhorns to a 25-22 win over No. 4 Ohio State earlier in the season. Overall, Texas ranked in the top ten in the nation in seven offensive and defensive categories. Colorado’s euphoria of two dominating conference wins would not last long in the heat of Austin if the Buffs did not come to play. Game time temperatures were forecast to be in the 80’s. The email came during the summer, when thoughts of Colorado football were not in the forefront in the minds of most fans. It came as part of a group email to those registered on the CU website. A Denver police officer had been shot in the line of duty, and there was a local radio station putting on a fund-raiser for the family. Many local businesses had donated items to an online auction. Alongside auctions for Bronco tickets, dinners with local celebrities, and sports memorabilia, was a donation from the University of Colorado: two press passes to a CU football game. Included in the package was premium parking, access to the field before the game, and access to the press conference after the game. Intrigued? Of course! In my 26th year as a Buff fan, I had never been in the press box, never been on the field before a game, and never at a press conference after a game. Did I want the tickets? Now, could I get the tickets? The bidding was already into the hundreds of dollars when I logged on. As the deadline approached, it appeared that it was coming down to myself and one other bidder. With my wife Lee rooting me on, we made our final bid with just a few minutes to go before the auction would be closed. As the final moments clicked off, we kept pecking away at the computer. Refresh, refresh, refresh …. and there it was! Auction closed! Scroll down … last bid … the tickets were mine! The Texas A&M game became the best choice, because it meant that I could take my longtime best friend Brad Geiger with me to the game. I know that Brad would appreciate all of the trappings as much as I would. We had traveled to locales such as Lincoln, Miami, Los Angeles, Phoenix, and Houston together for games. Who better to share the moment? Serendipity came to mind when we found out that Brad’s aunt and uncle from Galveston would be honored as “Donors of the Game”. We would be able to be on the sidelines for their moment of recognition. Our parking place for the game, courtesy of our passes, was right in front of the stadium. As Brad and I waited in the line of cars trying to find parking at the UMC parking area, we watched with growing impatience as car after car was turned away. When the parking folks saw our pass, though, we were waived right on through. Ninety minutes before kickoff, and we already knew it would be a special day. Not knowing how the press area worked, we first headed off to the Fieldhouse. We were directed to an elevator, taking us to the fourth floor. Once there, Brad and I encountered a two-tiered working area, with rows of chairs set out before a spectacular view of Folsom Field. Our fears of not having a place to sit were quickly alleviated when we found each seat had a place setting. A few minutes of searching led us to our seats – next to Sports Illustrated and the representatives from the Champs Sports Bowl! Confident that we would have a place to return to, Brad and I headed down to the field. 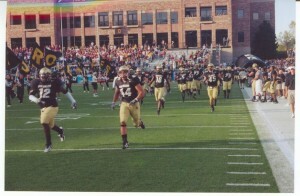 Walking the sidelines during warmups, between the two of us we took six rolls of film. We were so excited to be a part of the action, we even took pictures of the band during its pregame presentation. The next issue was how to take a picture of Ralphie leading the team onto the field. The near sideline was full of people, so Brad and I decided to stake out a position on the far 30-yard line, so as to get an unobstructed view of the CU mascot as she led the Buffs onto the field. With the teams now on the field, we raced up to the press box. We almost missed the fumble on the second play of the game – as it turned out, the last best chance for A&M. We were in our seats, with free sodas in hand, to watch the Buffs score on their first three drives. Could it get any better than this? The rest of the game was a blur. We got updates on statistics with each quarter, could watch the television coverage of the game on the televisions placed overhead, and could get up for food at any time. I did get the chance to introduce Brad to Dave Plati, and was very pleased when Dave recognized and acknowledged me even though there was a game going on, and he didn’t have time to chat. At halftime, we went back down to the field, looking for Brad’s aunt and uncle. We wandered around during the halftime festivities, but found no relatives. Deciding to stay on the field for the start of the third quarter, we got shots of Ralphie running back onto the field, and of Gary Barnett being interviewed for radio just before kickoff. Not too shabby! It was just after the third quarter started when we were approached by a young man in a suit, pointing out Brad’s aunt and uncle waving at us from the endzone. Their presentation was to take place at the first commercial time out. While watching the Buffs drive toward us, Brad’s uncle Fred introduced us to the new athletic director, Mike Bohn. We chatted as Mason Crosby kicked a field goal over our heads to give the Buffs a 34-6 lead. How cool was this night? We went back up to the press area until the last few minutes of the game, when we trailed other reporters as they gathered for the post-game press conference. After the contest was over, we went into the press area, where we were briefed, along with the press, by Gary Barnett, Joel Klatt, and Joe Klopfenstein. After lingering for a few more minutes to watch other players being interviewed, we walked back out into the now silent stadium. Clean up crews were already at work, so the lights were still on, illuminating the scoreboard which read, “CU 41, A&M 20”. What a great game. What a great night! – Against Texas A&M, the Colorado offense put up 559 total yards, the sixth most ever for Colorado in Big 12 play. – Tight end Quinn Sypniewski’s 70 yards on three catches represented a career high (he would go on to post 85 yards on four catches against Kansas State). – The win over Texas A&M gave Gary Barnett 31 conference wins, tying him with Dal Ward for 5th on CU’s all-time coaching list. – In a day dominated by the Colorado offense, a defensive player set a record. Punter John Torp placed two punts inside the Aggie 20-yard line, giving him 53 overall, surpassing the career record of 51 put up by Stan Koleski (1973-76). – The ever-prepared Dave Plati was able to inform the press box midway through the second quarter that Klatt’s 211 yards passing in the first quarter set single quarter marks for passing and total offense, surpassing Klatt’s already held record of 192 yards, set against North Texas on 9/18/04, (part of a 52-21 rout). This post, about the Texas A&M game, from the 2005 Season, is filed under Game.